Recently, I got the translating bug again, and managed to get a few texts translated from medieval Latin to English, and since these texts haven’t been translated elsewhere, why not share my productions with the world and help out expanding the knowledge we mighty magi possess? One such text, taken from the book “Hermes Trismegistus, Astrologia et divinatoria” (Corpus Christianorum, Continuatio Medievalis 144C, Brepols: Turnhout, 2001), is called the Liber Runarum, or “Book of Runes”, a 15th century text found in a few manuscripts describing a method of using runes (yes, actual Nordic runes!) in tandem with Hermetic astrological and angelic magic. 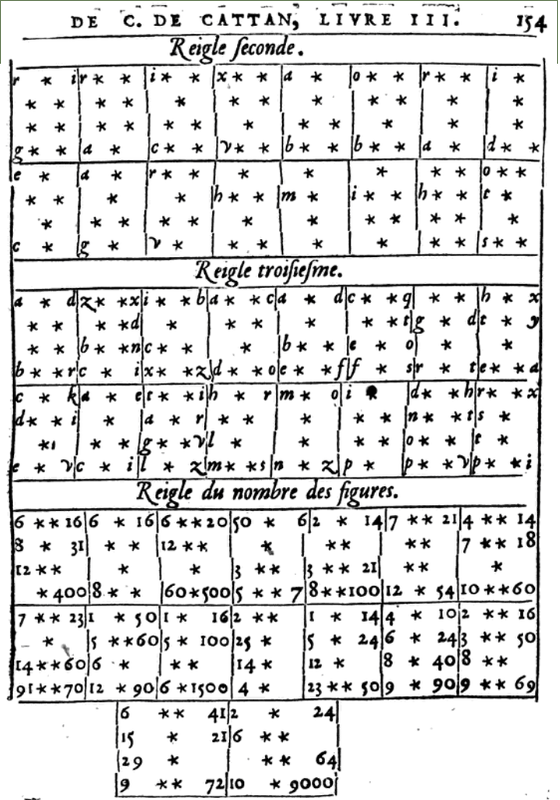 Unlike the runic correspondences offered by, say, Crowley in Liber 777 or Skinner in his “Complete Magician’s Tables”, this offers a simple method of ascribing the runes to the stars, linking them to the rest of the body of Hermetic knowledge. You can find the whole translation posted here, runes and all, but I wanted to talk about a specific method given in the Liber Runarum to write magical texts for talismans, charms, and the like. Each of the extracted signs is associated with two “runes”, or letters of the medieval runic alphabet still in use in the 15th century in parts of Europe and which have a more-or-less one-to-one correspondence with the Latin script in use at the time, which is the Latin alphabet we’re used to minus the letters J (a variant of I), and U and W (variants of V) . Each of the extracted signs is associated with two letters, with the exception of Rynybel, which only has one letter. These letters are given to the extracted signs in the order of the standard Latin alphabet; thus, Salmadis is given A and B, Lathlym is given C and D, and so forth through Rynybel, which is given only Z. Interestingly, each of the letters is also given an elemental nature from the four classical elements: fire, earth, air, and water. However, these letters are given elements based on the Zodiacal sign, not the extracted sign, that they most closely are associated with. So, for example, the extracted sign Salmadis starts off in Aries, a fire sign, and ends in Taurus, an earth sign; A “is taken from the first part” of Salmadis, and B “from the second”. So, A, being closer to Aries, is given to the element of fire and B, being closer to Taurus, is given to earth. This pattern follows all the way through, with Z being given to water due to its placement with Pisces. And yes, although I’m using the Latin alphabet, the texts use a version of medieval runes. Imagine that you’re using the runes, and you’ll be set. Below are one such version of the runes as given in the Liber Runarum, coupled with their standard medieval runic counterparts and their Latin transcriptions. For the sake of this post, I’ll just refer to the runes by their Latin letter equivalents. So, why does this matter? For inscribing magical talismans and image magic, of course, as was the fad in medieval and Renaissance Europe. The Liber Runarum is, like many other texts at the time, a book of angelic magic, and the text gives a list of angels, their associated planets, things they govern or rule, and the like. All this, plus a specific method for writing the names of angels or other things on talismans for magical purposes, by associated the elements with the letters so that inscribed words may be properly aligned to the forces of the cosmos. Now it is to be said about the changing of the figures abstracted from the stars according to the different parts of the signs, in the way that a figure entering under is put in the place of an opposing figure, and in this manner a change of the figures is made, which is nothing other than the removing of an opposing figure and a placing forth of another figure suitably entering under. So as to understand this change, moreover, the difference of the abstracted figures is to be noted by some standing alone, some obstructing, some entering under. Figures standing by themselves are those which do not need change but are suitably placed in a sculpture according to the need of a good combination. Opposing figures are those which cannot be placed in the sculpture due to the mixing of the arrangement of figures. Figures entering under are those which are well-put in the place of opposition. It is also to be noted that the figures standing by themselves make opposing figures and vice versa, and similarly figures entering under make those standing by themsleves and will oppose. However, of the figures standing by themselves it is to be known that they are unchanging and always placed in the sculpture without change and make the sculpture to ascend into the circle or the parts of the signs by which it had fallen, which are the figures that from the upper parts of the circle, or rather the Zodiac, [that] are taken with respect to the figures which are those placed in the sculpture. Figure standing by itself: a letter whose elemental nature agrees with the elemental position of the word. Figure opposing: a letter whose elemental nature is different from the elemental position of the word. Figures entering under: a letter replacing an opposing letter to supply the needed element for that elemental position. Write out the full word. Inspect the element associated with the first letter of the word. This letter begins the cycle of elements for the rest of the word. Inspect the successive letters of the word, noting the elements of the letters and the prescribed element for that position in the word. If a given letter has the same element as the position itself, leave it be. If a given letter has a different element as the position itself, change this letter to be replaced to the next letter in the alphabetic cycle with the needed element, the letter itself being taken from the extracted sign closest to the zodiac sign with a triplicity of the same element as the letter to be replaced. The first letter of this word is A, the element of which is Fire. Since the word is nine letters long and the first letter of the word is associated with Fire, the cycle of elements that the letters must obey will be Fire-Earth-Air-Water-Fire-Earth-Air-Water-Fire. The letters themselves in the word are A (fire), C (earth), E (air), L (earth), A (fire), C (earth), E (air), Y (water), L (earth). Most of the letters in the word follow this pattern, except the first L and the last L, which have different element than the order prescribes; the first L is earthy when a water letter is needed, and the last L is earthy when a fire letter is needed; both of these letters must be replaced to another with a proper elemental nature. The first L needs to be replaced by a water letter; the next water letters in the alphabet after L are O and P. O is taken from the second part of Affoquil, which starts in the third decan of Libra, and P is taken from the first part of Baltharie, which starts in the third decan of Scorpio. L itself is earthy, so whichever of the signs Affoquil (holding O) and Baltharie (holding P) is closest to an earth sign will be selected. Affoquil is closer to Virgo than Baltharie is to Capricorn, so Affoquil is chosen, replacing the first L with O. The second L needs to be replaced by a fire letter; the next fire letters are Q and R. Q is taken from the second part of Baltharie and R from the first part of Hanapel. Whichever of these signs is closest to an earth sign will be chosen. Hanapel is closer to earthy Capricorn than Baltharie is to Virgo (indeed, Baltharie overlaps into Capricorn! ), so Hanapel is chosen, replacing the second L with R.
By replacing these letters in this way, we get the resulting cipher ACEOACEYR. The first letter is I, which is Fire. The phrase IAO SABAOTH has ten letters, so the cycle must be Fire-Earth-Air-Water-Fire-Earth-Air-Water-Fire-Earth. The letters themselves are I (fire), A (fire), O (water), S (earth), A (fire), B (earth), A (fire), O (water), T (earth), H (fire). Of these, only the I of IAO and the first A, B, and O of SABAOTH fit according to this pattern; all the other letters must be changed. In other words, to use underlined letters to signify the letters to be changed, IAO SABAOTH. The A of IAO is fiery and needs to be replaced by an earth letter. The next two earth letters are B and C, from Salmadis and Lathlym, respectively. Salmadis is closer to a fire sign (Aries) than Lathlym is (Leo), so Salmadis’ letter B replaces A. The O of IAO is watery and needs to be replaced by an air letter. The next two earth letters are V and X, from Balyoel and Cariopel, respectively. Cariopel is closer to a water sign (Pisces) than Celecht is (Scorpio), so Cariopel’s letter X replaces O. The S of SABAOTH is earthy and needs to be replaced by a water letter. The next two water letters are Y and Z, from Cariopel and Rynybel, respectively. Cariopel is closer to a water sign (Pisces, overlapping it) than Rynybel is (Cancer, though it overlaps Pisces as well), so Cariopel’s letter Y replaces S.
The second A of SABAOTH is fiery and needs to be replaced by an air letter. The next two air letters are D and E, from Lathlym and Celecht, respectively. Lathlym is closer to a fire sign (Aries) than Celecht is (Leo), so Lathlym’s letter D replaces A. The T of SABAOTH is earthy and needs to be replaced by a fire letter. The next fire letter is A, from Salmadis. Because the A from Salmadis is alone without a companion fire letter, A is chosen by default to replace T.
The H of SABAOTH is fiery and needs to be replaced by an earth letter. The next two earth letters are K and L, from Ayleyl and Alyobe, respectively. Ayleyl is closer to a fire sign (Leo) than Alyobe is (Sagittarius), so Ayleyl’s letter K replaces H.
By replacing these letters in this way, we get the resulting cipher IBX YABDOAK. So, with the rule and examples understood (as surely you have, dear reader), here’s my conversion chart for any letter of the Latin runic alphabet into any element as needed. Bold letters indicate no change needed, and also the natural element of a given letter. To read this chart, find the letter to be enciphered in the leftmost column, then read across to find its enciphered equivalent according to the element needed. Because of the many-to-one conversion (the A in a cipher could stand for seven letters including itself), it’d be very, very difficult to decipher a word already enciphered without a lot of ingenuity and knowing probable letter combinations in a given language. Then again, this same mechanism of obfuscation helps obscure the meaning of the text from human eyes and human minds, just as common methods of sigilization do, and also help to align a given word with the starry forces that govern existence down here. The obfuscation part is kinda ingenious, not gonna lie, especially for doing stellar magic generally and leaving behind magical items in public without being too blatantly skeevy or sketchy. After all, why write “DIE IN A FIRE” and get arrested or fired when you can write “DPHKNGHKVF” instead and have nobody (but the spirits) know the better? Bonus points if you actually use medieval runes, futhark, futhorc, or, hell, even Theban script. Of course, the method above is what I can say on the matter. The different versions of the Liber Runarum offer different examples, with one manuscript showing the names of the angels written four times each, each time using a different change. I honestly don’t know why this might be, or whether some of them are just wrong or are further confused or use a different method, but the above cipher is simple and regular enough to be easily applied in magical inscriptions. Alternatively, different letters might be used (while still fulfilling that same elemental restriction) based on their exact sign, using more zodiacal and planetary reasons for selecting a particular letter over another for a given purpose.